This is the material strength divided by the load. Higher values are safer. If the material can take 50,000 PSI of stress and the load puts 25,000 PSI of stress on the material, the safety factor is 2 (the material is 2 times as strong as the stress from the load). Pressure level a material can take before it starts to bend and not return to its original shape after the force is removed. Pressure level that will fracture a material. This will typically result in the structure failing as a safety device. 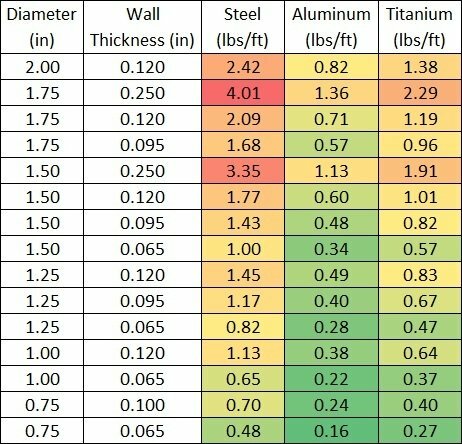 You should use this calculator to compare materials, diameters, and wall thicknesses to find out how to make your designs safer. For example, lets say your local metal distributor has 1.75x.095 tube and 1.25 solid bar on sale from some huge bulk purchase that fell through with another customer. You pick them both up and look at them, and they both feel pretty beefy. But you look at the thin wall on the 1.75x.095 and decide that light junk can’t be as strong as the 1.25 solid bar, right? Wrong. Type them both into our calculator, and check other sources if you still aren’t sure. The .095 wall is actually stronger for bending loads! You can also look at individual parts of a roll cage under load, but please understand that evaluating roll cages is work done by trained professionals and any evaluation you do on individual parts does not indicate the overall safety of the structure. Material is nominal size (material is commonly under nominal size, but within material geometry specs, like .120 wall being actually .118). Vehicle load is a static distributed load in the middle of the longest tube and is 1/3 the tube length. Loading in the middle of the longest tube is a worst case for stress on a cage member. Square tube assumes bending with one side parallel to the load (think square vs diamond). The safety factors use the numbers in the table below for strength. Don’t forget that putting hard metal close to occupants is very dangerous, so the use of proper seating, restraints, padding and helmets should always be considered. The red arrow in the picture below is the load, maybe a rock or a stump. We chose the longest tube that is likely to hit during a roll (blue). In this example, we are assuming we will triangulate the rear to pieces so that they are shorter than the roof member, and also assuming that a front stinger (not shown) will prevent the front fender bars (long pieces on the left) from ever being hit directly. This calculator assumes the load is in the center (worst case for stress), and distributed about 1/3 of the tube length (highlighted in red). This cage is just a simple example for teaching purposes, we don’t recommend you build a cage like this. This calculator is based on many assumptions and “worst-case” criteria, so we recommend you read the whole page to get a full understanding of what these numbers actually mean and why we should consider them during roll cage design. This example is only showing how you could consider an isolated load on one part of your roll cage. We hope you find this information helpful and that you don’t consider it to be any sort of approval of your design. In a real rollover, the weight of your vehicle will not be a static load on just one tube. Your vehicle will be moving, with many tubes in the roll cage supporting constantly changing loads during the roll. The laod will spread out over more than one tube when 2 or more tubes are in contact with the ground/rocks/etc. You may also want to consider that a moving vehicle will put more load on a tube than a stopped vehicle. One other consideration during a real rollover is that when a tube bends, the shape of the roll cage changes and more tubes will come in contact with the ground to support the vehicle. If nothing bends and the vehicle ends up on its roof, it can’t stay balanced on just one tube, so it will still have more than one tube sharing the load once it finally stops moving. The ground can also move to change the load distribution, like rocks moving and dirt/sand changing shape. 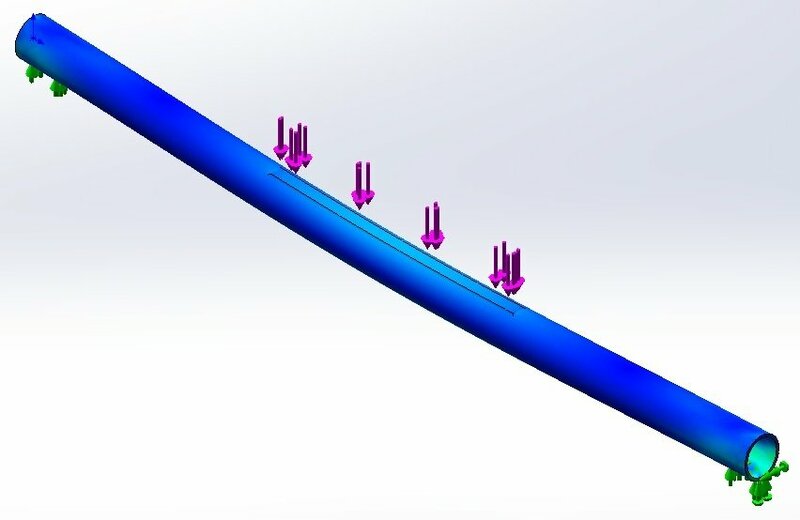 All of this discussion about more than one tube sharing the load is to illustrate the fact that there is more to roll cage stress analysis than just looking at one tube at a time. We hope you are able to use this tool to learn and evaluate parts of your design. Use the color coded table below to quickly see how much each material and tube size will weigh per foot (all materials are round tube). 6063-T52 AL: This is Aluminum (AL). 6063 is the alloy designation, with 6000 being the series for aluminum alloys containing silicon and magnesium for heat treating purposes. T stands for thermally treated, which is done to improve its physical properties. 52 is the type of thermal treating, in this case compression stress relief after solution heat treat. This low strength aluminum bends very well. 6061-T6 AL: This is Aluminum (AL). 6061 is the alloy designation, with 6000 being the series for aluminum alloys containing silicon and magnesium for heat treating purposes. T stands for thermally treated, which is done to improve its physical properties. 6 is the type of thermal treating, in this case solution heat treated and then artificially aged. This common medium strength aluminum can be welded and also bent, though not as easily as 6063. 7075-T6 AL: This is Aluminum (AL). 7075 is the alloy designation, with 7000 being the series for aluminum alloys containing zinc and small amounts of magnesium (both for strength). T stands for thermally treated, which is done to improve its physical properties. 6 is the type of thermal treating, in this case solution heat treated and then artificially aged. This is one of the strongest aluminum alloys, and is not very weldable and is very difficult to bend. ASTM A53 Pipe: See our discussion on the bender tech page-“Tube vs Pipe”. This medium/low strength steel is manufactured to the requirements set by the American Society for Testing and Materials (ASTM), document A53. The material is steel alloy, with a wide range of options for composition. The material can include several alloying elements (for example, up to 0.4% chromium and 0.15% molybdenum, but as little as 0.0% of both). It bends and welds easily. HREW 1015: Hot Rolled Electric Welded tube, 1015 steel alloy. This tube is formed through rollers from flat strips into round tubes and welded into a solid piece. The outside is smooth, and the inside may have slight flashing. A seam is visible, usually a blue/grey stripe. 1000 series steels are known as plain carbon steels, and are limited to 1% manganese content maximum. The last two digits are the nominal carbon content in hundredths of a percent. 1015 has 0.15% carbon content, and 0.45% manganese. It is very weldable and forms/bends easily. DOM 1020: This tube is formed through rollers from flat strips into round tubes and welded into a solid piece and subsequently drawn over a mandrel (DOM) to compress the material and finish it to a precise size and geometry. The inside and outside are smooth, with no seam visible. Alloy is the same as 1015 above, but with 0.20% carbon by weight, contributing to a higher overall strength at a slightly lower ductility. 4130 N: This steel is in a class of case-hardenable steel alloys. Commonly known as “ChroMo” or “ChroMoly”, this metal is alloyed with chromium and molybdenum for strength. Similar to the steels above, the last two digits are the carbon content, 0.3% nominal. 4130 is famous for its high ultimate strength and toughness, and it bends and welds acceptably. TIG is the preferred welding process for this alloy. It must be heat treated after welding to bring it back to the specs posted here. It can also be heat treated and tempered/quenched to increase the yield strength over 100 Ksi (1). SS 316: This high corrosion resistance stainless steel was put on this page for comparison purposes. Its cost/strength ratio is not very good. It is commonly made into round tube. Ti 3AL-2.5V CWSR: This is Cold Worked Stress Relieved Titanium (CWSR Ti). It contains 3.0% aluminum and 2.5% vanadium by weight. This titanium is an alpha-beta alloy, belonging to a class of alloys that are not easily welded since they are already treated for hardness. TIG is almost a must for welding this material. It is very hard to machine and has limited documented use in formed bends. It is available as round tube. Disclaimer:HREW can be made from MANY different steels and commonly has yield strengths as low as 40,000 PSI. Check with your tube supplier for your exact values. This information is for reference only. If you don’t want to get hurt or killed, stay in your home and don’t operate any vehicles. No roll cage will save your life in all situations. This calculator is intended to help aid in the design process, which must be carried out by a trained professional. Any information provided by Rogue Fabrication, LLC, is not an acceptable substitution for professional analysis or a promise or certification of the performance of any material or design. By using this form you are absolving Rogue Fabrication, LLC, from any and all liability for the damage to people and property from the use and/or misuse of any information provided or attained. (1): Machinery’s Handbook, Industrial Press. 28th Edition, 2008. (2): Matweb, www.matweb.com. Access date 11/8/2012. (3): Online Metals, www.onlinemetals.com. Access date 11/8/2012. (5): Team Tube, LLC. Portland, Oregon. Supplier data, date 11/24/2012. (6): Titanium Joe, www.titaniumjoe.com. Access date 11/8/2012. (7): ASTM A53 1999 full text, ASTM. Cost factor based on 1.75x.120 per foot, except Ti which is 1.625x.070, 316 SS which is 1.5x.120, and 6063 which is 2.00x.125.